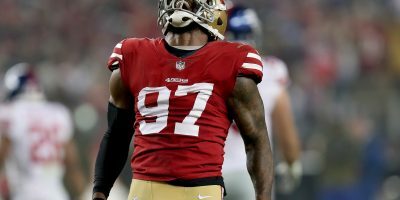 After losing pillars of strength in Anthony Davis and Mike Iupati, the 49ers tried plugging the gaping holes along their offensive line with what seemingly amounted to a mathematical equation. 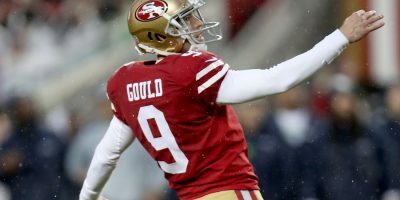 By inserting one player, moving another, and substituting yet another, the 49ers hope their formula will add protection to QB Colin Kaepernick while subtracting from the third-worst number of sacks allowed during 2014, a whopping 52. 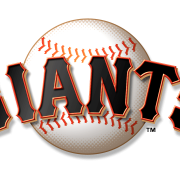 But after strapping on their pads for their first test of training camp, the offensive line received what would have amounted to a failing grade Tuesday, after the 49ers defense terrorized Kaepernick and his backfield mates all day. 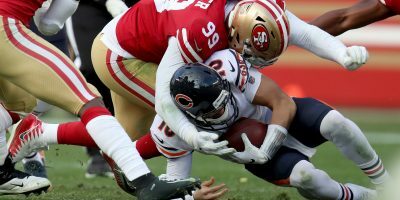 The 49ers offensive line looked overmatched on the field, allowing what would be nearly double-digit sacks on a day that saw Kaepernick and backup QB Blaine Gabbert in constant motion as the defense closed in on them. Every defensive unit, including the defensive line, linebackers, cornerbacks, and safeties had tallied a would-be sack by the end of the day during 11-on-11 drills, with many other snaps resulting in quarterback hurries that saw an offense struggle to move the ball through the air. 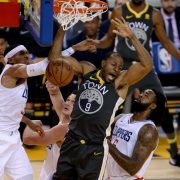 The defense’s dominance was on full display during the day’s highlight as safety Eric Reid blitzed from the right side, immediately forcing Kaepernick into a hurried throw. Intended for Quinton Patton along the sideline, CB Shareece Wright cut off the pass instead, returning it for what would have been a pick-six. 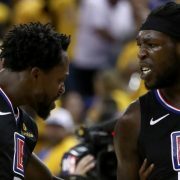 The ground game fared no better, as many running backs were met at or behind the line of scrimmage as the new-look line failed to clear a path on many attempts. 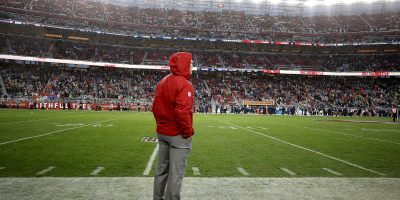 The outing was bleak for a unit central to the 49ers success in executing a new offensive system under offensive coordinator Geep Chryst, though a steep learning curve is to be expected as the new-look unit searches for chemistry and continuity in an area where cohesiveness as a whole trumps personal strengths. One positive take-away from the offensive unit Tuesday was their quickness in getting to the line of scrimmage. After delay of game penalties plagued the team, even at home, head coach Jim Tomsula and Chryst stressed a faster tempo offense that simplified play calling to cut down on time in the huddle. This was apparent Tuesday as the unit often got to the line of scrimmage with 15 seconds or more on the play clock. This type of up-tempo play will help the 49ers offensive line as defenses will be forced to rely on listening for the snap count instead of watching the trickling play clock as to when the snap is coming. 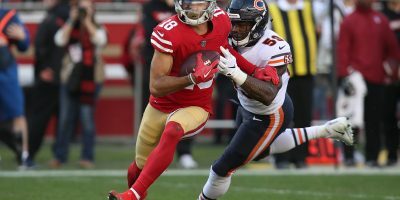 Although the 49ers defense certainly wasn’t fooled on Tuesday, Boone mentioned the type of advantages an up-tempo offense offers. Rookie OLB Eli Harold had himself a strong showing during the day in both one-on-one and 11-on-11 drills, getting around both G Brandon Thomas and OL Trent Brown for would-be sacks. … OLB Corey Lemonier, who was largely lost in the shuffle after LB Aaron Lynch‘s ascension last season, looked strong, making loud contact with his opposition in one-on-one drills. … In his first practice with pads, RB Jarryd Hayne showed off strong pass protection skills, even earning very vocal praise from RB’s coach Tom Rathman for his block of LB Nick Moody in a one-on-one drill. However, he fell victim to LB Philip Wheeler‘s spin move shortly after. 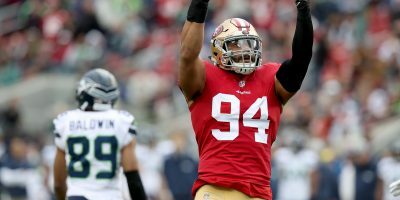 … Both of the 49ers projected starting linebackers were out of action Tuesday as Michael Wilhoite continues to work through an injury, and NaVorro Bowman was given a veteran’s day off. Shane Skov and Nick Moody earned first team reps, with both finding their way to the quarterback during drills. … On the offensive side, RB Reggie Bush was held out of practice again, although not due to injury, while WR Jerome Simpson was excused for practice, most likely for personal reasons, according to a source.